When you need to share custom forms with all users within your organization, you should use an Organizational Forms Library. When you publish a custom form in the Organizational Forms Library, you only have to maintain a single published form, regardless of how many folders are using the form. Everyone can access these forms provided that they have the correct permissions to the library. Administrators and others with the correct permissions can publish custom forms to the Organizational Forms Library; by default, anyone can access the Organizational Forms Library. 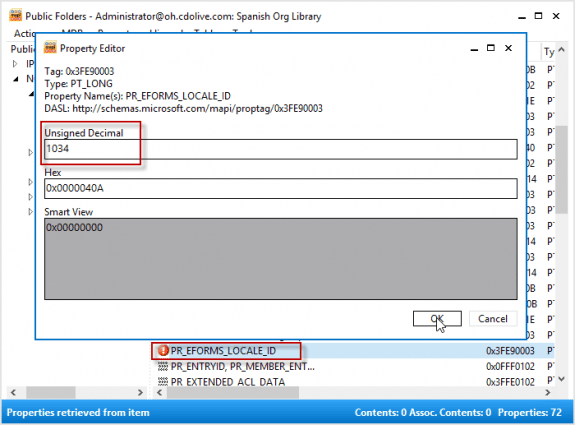 Configuring an organizational forms library in Exchange 2007 or Exchange 2010 is very easy. Of course, in Exchange 2010 you need to have Public Folders enabled. These instructions assume that public folders are already enabled. You can have multiple Organizational Forms Libraries, but with a big limitation: you can only have one Organizational Forms Library per language. If you are in a multi-language environment, you need to create a folder for each locale. To completely configure the Organizational Forms Library, you need to have Exchange administrator permissions on your account or use an Exchange administrator account to configure the forms library. 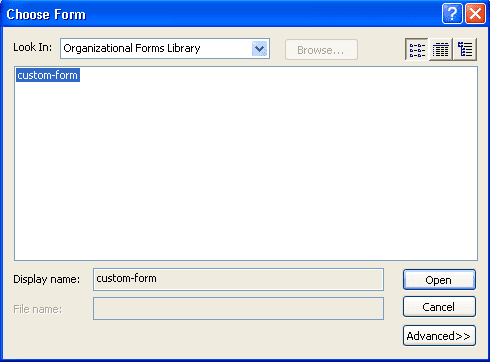 You can create the Organizational Forms Library either through the public folder management console or using a cmdlet. Use the following steps to create the Organizational Forms Library in either Exchange 2007 or Exchange 2010. Expand the Toolbox and double click on Public Folder Management Console. 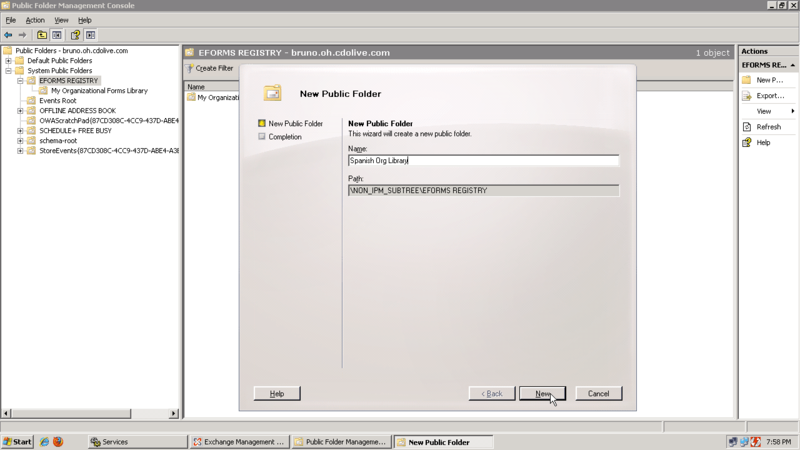 Expand the Public Folder tree and System Public Folders, and then EFORMS REGISTRY. In the right pane, right-click and choose New Public Folder. Enter a name for your public folder. You can use "My Organizational Forms Library" or any name that you choose. If you're creating multi-language organizational form libraries, you may want to name each folder for the language that it's going to serve. Click New to complete the wizard. Now that you've created the Organizational Forms Library folder, you need to use MFCMAPI (on your desktop computer) to finish configuring it. Note: you need to log in using a mailbox that has Exchange administrator permissions! Double click on Public Folders, expand Public Root, NON-IPM-SUBTREE and finally, click on EFORMS REGISTRY. Select the Organizational Forms Library you need to configure then click on Property in the menu. Choose Additional Properties from the menu. Click the Add button and then click Select Property Tag button. Browse through the property tags to find PR_EFORMS_LOCALE_ID. Select it and click OK.
Click OK twice more to close the dialog and return the Public Folder subtree in MFCMAPI. In the property names list, locate PR_EFORMS_LOCALE_ID; it will have a red exclamation point icon. Double-click on PR_EFORMS_LOCALE_ID, and then type the four digit locale code in the Unsigned Decimal field. If using Exchange 2007, click OK and close the MFCMAPI dialog boxes. You are now ready to use the Organizational Forms Library in Exchange 2007. When users open the Choose Form dialog, the Organizational Forms Library should be listed by default. Exchange 2010 admins will need to set the PR_URL_NAME property. This can be set using MFCMAPI on the client or ExFolder on the Exchange server. In MFCMAPI, repeat the steps above, beginning with Step 3. Choose PR_URL_NAME from the list of Property tags, then click Ok to return to the Property listing. Right click on PR_URL_NAME and choose Edit Property. Enter your Organizational Forms Library path: \NON_IPM_SUBTREE\EFORMS REGISTRY\English Orgin the Ansi field. Double click to ExFolder at C:\Program Files\Microsoft\Exchange Server\V14\Bin\ExFolder.exe. Click Connect and select the server. Click OK to connect to it. Right click on the Organizational Forms Library you created and choose Bulk Property Editor. Select PR_URL_NAMRE from the Property list. 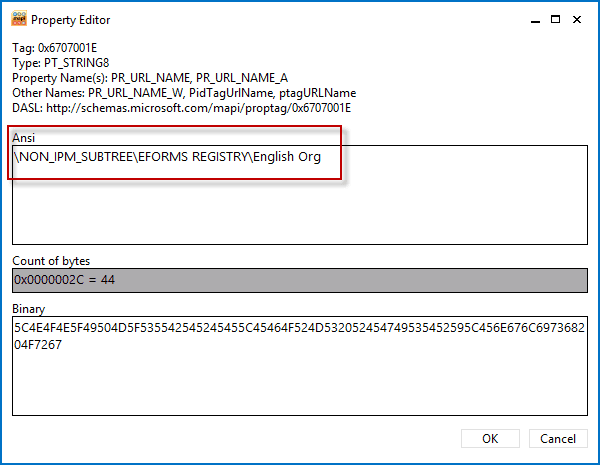 Select Set and type \NON_IPM_SUBTREE\EFORMS REGISTRY\English Org in the field. By default, authenticated users can access the published forms. To give other users permission to publish forms, you need to set the permissions using the Exchange Management Shell. In Exchange 2010, you can also use ExFolder to set the permissions. Add-PublicFolderClientPermission -Identity "/NON_IPM_SUBTREE/EFORMS REGISTRY/Organizational Forms Library" -User dianep -AccessRights Owner -Server "Servername"
Get-PublicFolderClientPermission -Identity "/NON_IPM_SUBTREE/EFORMS REGISTRY/Organizational Forms Library"